Hello again, and this week I’ll start by writing a little on Cunard’s youngest ship, Queen Elizabeth, which as I mentioned last week is currently having a refit in France with refurbishment of staterooms and suites as well as many of the public areas. “Discover our new Alaska itinerary with six charming ports to explore, all from the comfort of elegant Queen Elizabeth. Feast your eyes on towering glaciers and ice fields, native wildlife and national parks with full days in port. Or sit back, relax and absorb stunning views on deck or from your own private balcony”. 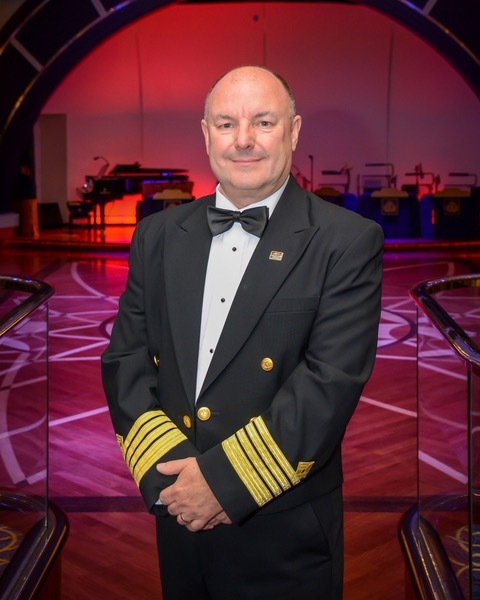 I myself spent time as a Navigating Officer in Alaska many years ago with Princess Cruises, who were one of the first cruise lines to open up that fascinating destination and I can fully recommend it. What breathtaking scenery and wildlife there is to be seen in that incredible part of the world and I believe that the very best way to experience it is from the open decks of a cruise ship and now that Cunard are cruising there, you will be able to experience not only that, but also the full luxury on board Cunard experience as well…!! I well remember one particular small port in Alaska named Whittier, where we spent an overnight each time we were there, whilst departing guests left at the end of their cruise and the new ones arrived, fresh from the airport at Anchorage. This overnight stay gave us Officers a chance to visit the small local bar and grill at Whittier named, if I recall correctly “The Sportsman” for some dinner and evening downtime. The most startling thing about that was that when it came time to return to the ship which was only a few hundred yards away the main thing to look out for was the bears! They would think nothing of coming to see what was happening near The Sportsman and I recall that on more than one occasion we had to beat a rather hasty retreat back to the safety of the ship! No such concerns for you, dear readers, should you choose one of Cunard’s 10 day round trip voyages from Vancouver where you can visit Alaska’s first city of tiny Ketchikan and today’s capital, Juneau, for some glacier flightseeing or kayaking amidst the stunning Alaskan landscape. Stop off at Icy Strait Point, where whales may be spotted from ashore and the hidden port of Sitka to discover Alaska’s oldest National Park. Visit gold-rush towns like Skagway, Gateway to the Klondike, before experiencing Victoria’s unique blend of historic charm and contemporary charisma, on your return to Vancouver. Following on from my story last week of the origins of the saying “Right to the Bitter End!”, another of my favorite nautical sayings which is now part of everyday language is the expression “Loose cannon” which we would use to mean an unpredictable person or thing, liable to cause damage if not kept in check by others. Now this comes directly from a nautical origin, because from the 17th century to the 19th century, wooden warships carried cannon as their primary offensive weapons. In order to avoid damage from their enormous recoil when fired they were mounted on rollers and secured with rope. A loose cannon was just what it sounds like, that is, a cannon that had become free of its restraints and was rolling dangerously about the deck. How interesting..!! Now that I have finally retired from Captaining cruise ships, it leaves me more chance to travel the world in other ways and I’m very excited to say that my wife and I are currently investigating the possibility of taking a trip to the beautiful but remote country of Chile in the New Year! I have been lucky enough to cruise the Chilean Fjords in the past and it is truly breathtaking, so I am looking forward to the opportunity to see much more of that lovely country and being able to tell you a little more about it at that time.